Thrift Score Thursday: Halloween Madness! 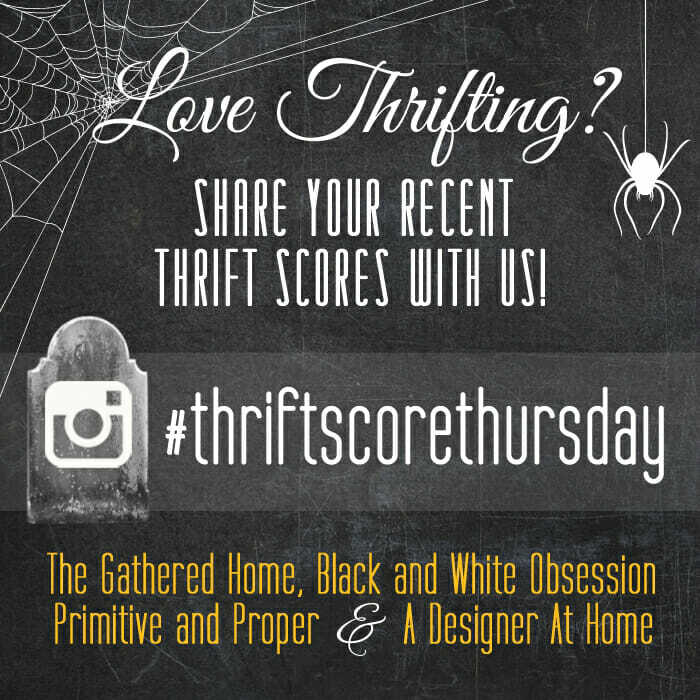 Welcome to a special edition of #thriftscorethursday where we will be sharing Halloween madness with several fabulous guest hosts! With Halloween this weekend, next week we will all be featuring our favorites Halloween themed thrift scores! So share those thrifted upcycled costumes, hunted haunted decor, and more! This week my cohosts, guest hosts (Coco, Colleen, Jess, Gretchen, Nicole & Paula), and I are sharing our own Halloween inspiration posts for you. Now, I already had my kids and my own costume picked out, and I had decided no more Halloween decor this year, so where did that leave me? Well, I am instead going to share something that inspired me. 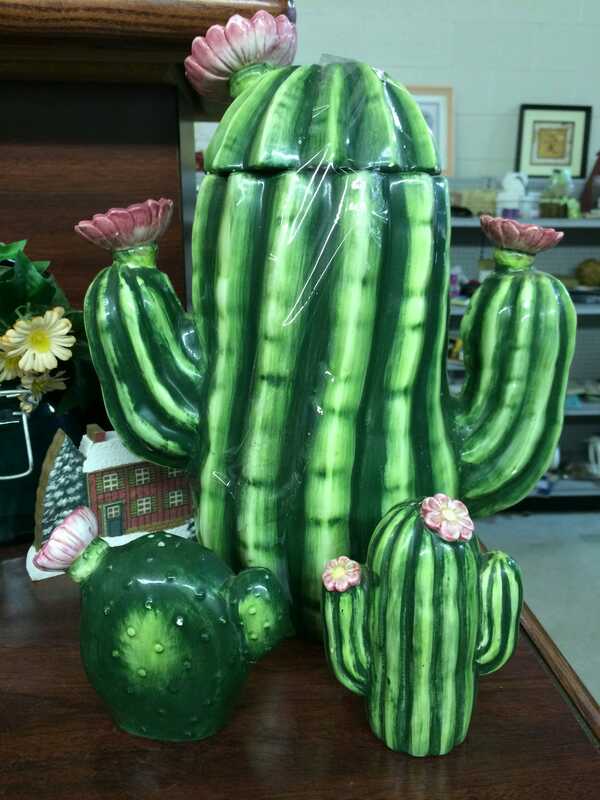 I was out thrifting last week when I came across this cactus cookie jar and S&P shakers. Funky, right? What does this cactus have to do with Halloween? Well I looked at it and thought it would make a great costume! No, I don’t think wearing the cookie jar is a good idea, but I thought, “Green pants, green hoodie, a couple pink flowers, and some kind of pricklies, and you have yourself one fine costume!” And guess what? I googled it and found that someone else had the exact same idea and went ahead and made it. Check it out at The Chic Site! Now for my features…. this week I am sharing regular thrift score favorites, but next week will be all Halloween features. Anna is finding all of the wonderful things lately, like this awesome wall hanging! You can find Anna on instagram here. Next up is that flatware Karrie Anne scored. I love the details! You can find Karrie Anne on instagram here. I have featured Love Recycled a few times now; Florida must have some of the most unique finds out there! 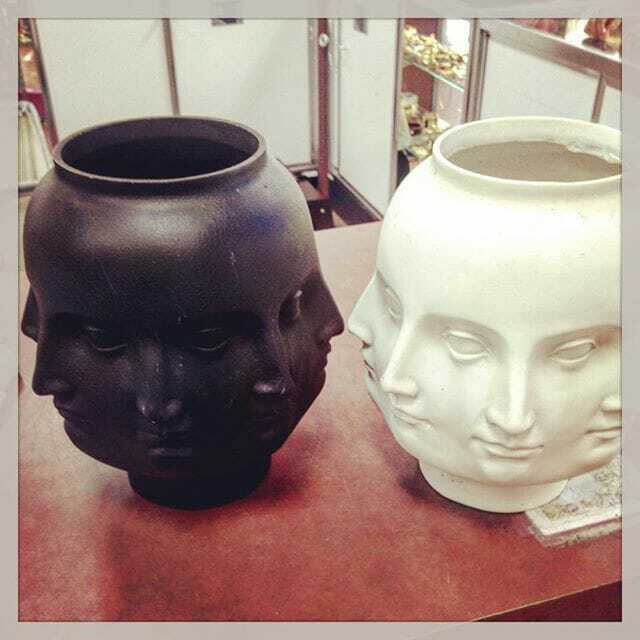 Love these head planters/vases! You can find Love Recycled on instagram here. Kate needs a blog. Because I want to pin all of her work…. this girl is amazing! 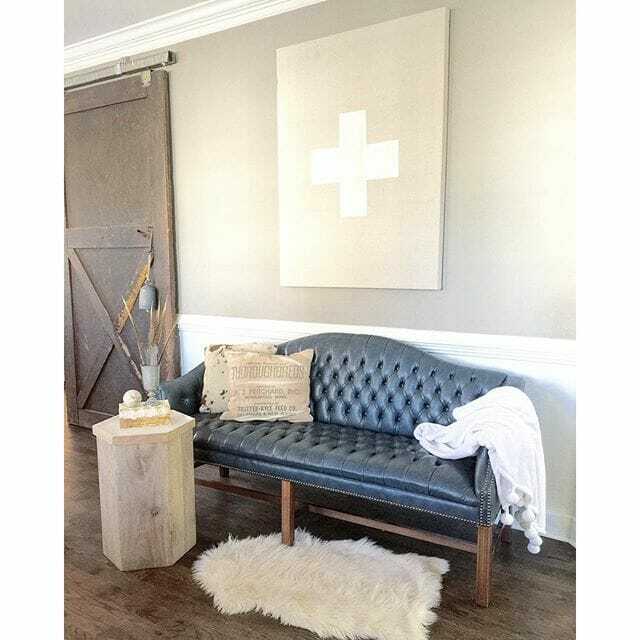 Check out this tufted blue sofa she scored! You can find Kate on instagram here. Kristen won this trophy! Well, not exactly. Someone else won it a long time ago, but isn’t it awesome? You can find Kristen on instagram here. Be sure to visit all of our guest hosts this week as well as my regular cohosts to see their own Halloween thrifty finds!!! All of the guest hosts will be sharing their Halloween thrifty inspiration with you, and regular cohosts will also be sharing features this week. Have fun visiting all of my cohosts. 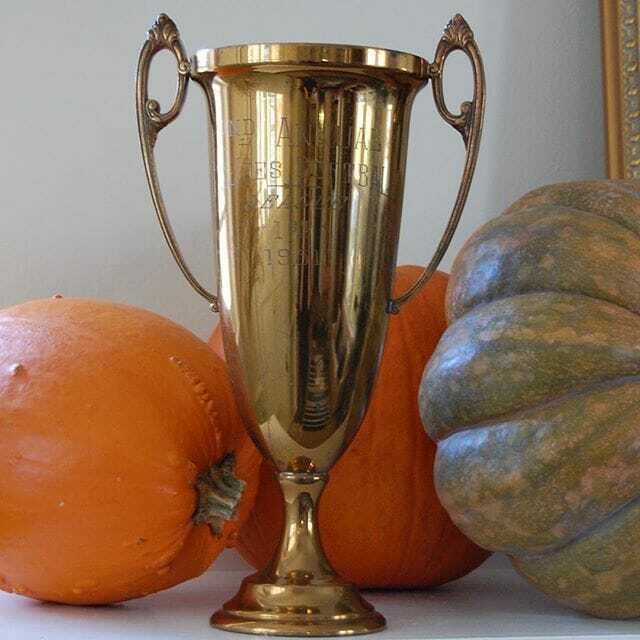 Can’t wait to see your thrifted Halloween finds this weekend and show them off next week! me, too! i want them all! 🙂 thanks for cohosting and happy halloween to you! Ahhh! The cactus costume exists!!! So fun! I actually totally love that cactus cookie jar too… I think it needs to come live with me since I already have (sort of) matching s&p shakers! That flatware is AMAZING. I would buy that in a heartbeat. The detail is so pretty! me, too! it’s so elegant! I have been looking for head vases like that. Love them and please tell me you got that cactus. I want it too. i didn’t get it. sorry! and yes those head vases- amazing! a cactus costume! that would be so fun! 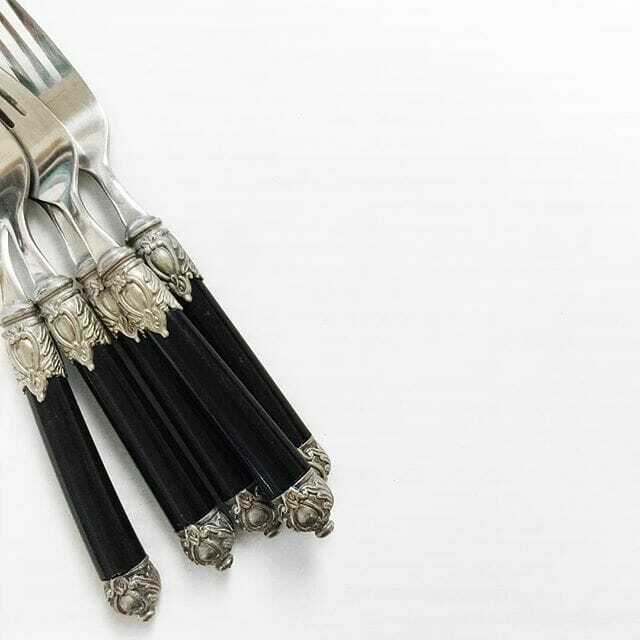 and that flatware is super amazing. That tufted blue sofa is amazing! I know that I would have seriously considered buying it had I spotted it while thrifting. Please tell me you bought the cactus! I need it in my life!! Seriously if you buy it I will pay…. it would! i didn’t buy it- i liked it but it didn’t fit my home as well. Flatware, the sofa & the head vase, yes, yes, yes! I’m always amazed at what treasures everyone finds! that head vase is amazing! All such great finds! LOVE those head planters! Thanks for sharing my trophy! Cacti costume, how clever!! I’m sure that’s totally up Corinna’s (ahem cacti-obsessed) alley ha! That cactus set is awesome! 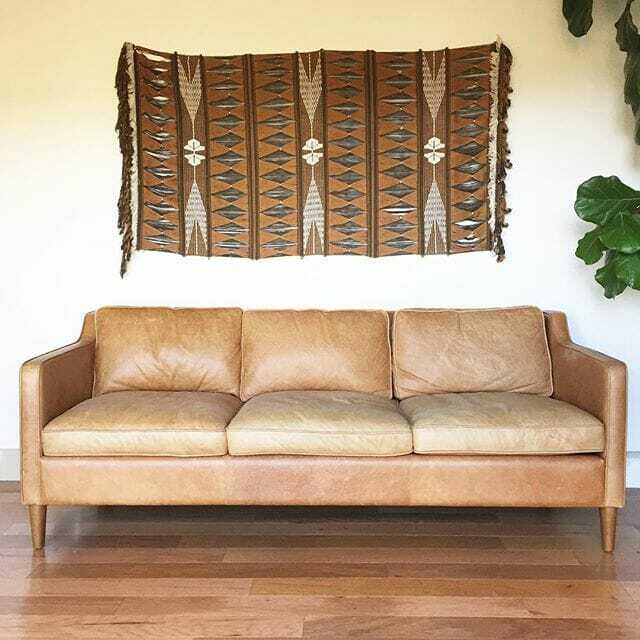 I want that leather sofa and wall hanging. I think the sofa is from west elm. I’ve been eyeing it! i want it all, too! What wonderful finds! Those ceramic vases look just like the Jonathan Adler ones they sell for tons of money! Such great features! they totally do- you are right!